Can we treat ADHD symptoms via Tyrosine supplementation? This is the 3rd post in our series of discussions regarding ADHD and supplementation with the amino acid tyrosine. Some physicians (and ADHD patients) swear by it, but the results in the literature and clinical studies are often muddled. Why is this the case? Over the past few postings, I have been going over the metabolic pathway of how the body converts the amino acid tyrosine to our desired brain chemicals of dopamine and norepinephrine. Imbalances of both dopamine and norepinephrine are typically seen in ADHD, and this imbalance is the target of most ADHD medications (especially the stimulants) during their modes of action. In our first post on ADHD and tyrosine supplementation, we went through the overview of this pathway. In our last posting, we went through the first step of the process: the conversion of tyrosine (also referred to as L-tyrosine) to DOPA (also referred to as L-DOPA, Levodopa and a number of trade names such as Dopar, Laradopar or Sinemet), and the enzymes and nutrient co-factors involved in this conversion process. L-DOPA is a common treatment method for patients with Parkinson's Disease. I was going to start with the next step of the process today: the conversion of L-DOPA to dopamine, and the major enzymes involved. However, one of our readers from the previous posting on the conversion of Tyrosine to L-DOPA, posed an excellent question on a topic I failed to address (which may be on the minds of several readers). As a result, I will dedicate the remainder of this post to this question and save the next step of the tyrosine to dopamine pathway for the next blog entry. LynneC asked about the advantages of supplementing with tyrosine vs. supplementing directly with L-DOPA. As we saw in the previous posting on tyrosine supplementation for ADHD, the tyrosine to dopamine conversion requires one major enzyme (tyrosine hydroxylase) and several secondary enzymes (to produce some of the compounds needed to help the tyrosine hydroxylase enzyme to function properly), as well as nutrient co-factors such as iron, zinc, magnesium, and even antioxidants or reducing agents such as vitamin C.
Further complicating the issue, we saw that individual variation across the gene pool leads to different forms of this tyrosine hydroxylase enzyme, some of which are notably more effective or "potent" than others. In other words, some people are more disposed to having an efficient metabolic conversion of tyrosine to L-DOPA than others. Supplement Availability: L-Tyrosine is available over-the-counter. However (until relatively recently), L-DOPA required a prescription. This is not the case anymore, however, as L-DOPA supplements are available in countries like the United States (I believe that a prescription is still required in Canada, however, but I could be wrong). Blogger's note: Even though both of these agents are available without a prescription, this blogger believes is is EXTREMELY important for you to talk to your physician before giving either of these supplements a try. Both tyrosine and L-DOPA can undergo biochemical transformations via a number of different pathways (i.e. not just in the conversion to catecholamines in the brain such as dopamine and norepinephrine). Both can interact with other medications (especially certain classes of anti-depressants known as MAOI's or monoamine oxidase inhibitors), as well as with each other, and overdosing is possible. Additionally, individuals with certain forms of cancer (especially skin cancers) or eye disorders such as glaucoma are typically instructed to avoid both treatments entirely. PLEASE check with a physician before starting either of these as a therapy for ADHD or ANY other reason. Cost: I did a quick search on the costs of both supplements (keep in mind that brand names, strengths and quantities can cause extreme variation), and from what I've seen, L-DOPA often costs somewhere from about $65 to $150 US dollars for 100 tablets. Please note that L-DOPA typically comes in a combination form of Levodopa and another compound called Carbidopa (Carbidopa greatly aids in the absorption of Levodopa and helps minimize unwanted side-reactions of the Levodopa drug, so almost all standard formulas now exist in this Levodopa/Carbidopa tandem). For tyrosine, the cost is much lower, as I've seen ads online for a bottle of 100 capsules (500 mg strength, note that many individuals who supplement with tyrosine take doses around this level 3 times a day) for only $2 to $3 dollars a bottle. Clearly, the cost of taking L-tyrosine is much lower. Step in the conversion pathway: In the previous post, we saw how certain enzymes (tyrosine hydroxylase) and nutrient "co-factors" (co-factors essentially function as "helpers" to the enzyme, making it function more effectively. If these co-factors are missing or deficient, the enzyme is often compromised, and the metabolic conversion process is reduced. In this blogger's opinion, co-factor shortages are one of the most overlooked reasons why natural, dietary or supplementation strategies for ADHD treatment often fail), such as iron, zinc, magnesium, and vitamin C are needed, either directly or indirectly to aid the process. * Starting directly with L-DOPA bypasses these factors or complications (but poses its own set of challenges, as we'll see later in this post, more about this in a minute). Transportability across the blood-brain barrier: We talked at length about the blood-brain barrier in the past two posts, but to recap: The blood-brain barrier is a biochemical barrier designed to keep potentially hazardous or toxic compounds (that accidentally get into the blood) from getting into the brain (where these substances are often much more devastating). It also acts like a sort of "filtering" system, controlling or regulating the transport of "good" compounds in the brain, reducing the risk of imbalances from these chemicals. Unfortunately (especially for drug manufacturers), this barrier also blocks out many potential therapeutic agents, so drugs targeting specific brain regions must be chemically designed to pass through this blood-brain barrier to be effective. It is worth noting that both tyrosine and L-DOPA can cross through this barrier, so both are acceptable methods of delivery to increase or balance out dopamine and norepinephrine levels in the brain. On a side note (and mentioned in our previous discussions on the matter), dopamine and norepinephrine typically are NOT able to pass through the blood brain barrier, meaning that these compounds need to be manufactured inside of the brain. This is why we cannot supplement with either of these agents directly. **We will see in the next few points, how this "tie" between the two may not be entirely true. "Target" specificity: Here is where the real difference lies. In the past few posts, we have been vague with regards to the specific brain regions in which chemical imbalances of dopamine and norepinephrine are found in the ADHD brain. It is important to note, that these deficiencies/imbalances are not uniform throughout the body (or even the brain) in the ADHD individual. Certain brain regions are frequently identified as target sites of chemical imbalances (which typically exist as deficits, not excesses) of the neurotransmitters dopamine and norepinephrine. By no means is this list extensive, but two brain regions which are commonly associated with shortages of these signaling chemicals are the striatum and the prefrontal cortex (as an interesting aside, these 2 brain regions have been found to be proportionally smaller in ADHD individuals according to some studies and bloodflow patterns to the prefrontal cortex have been found to be different in the ADHD brain vs. the brains of patients with other disorders such as Obsessive Compulsive disorders). Shown above is a picture of an individual's brain. We are looking from the top down on a patient facing forward (the front is towards the top of the page). Several key "ADHD brain regions" are highlighted. 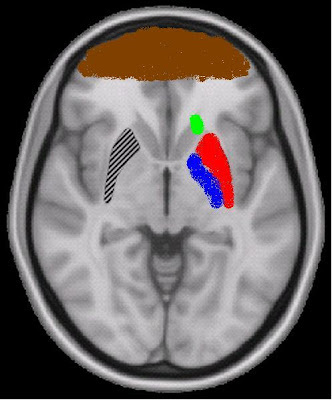 The rough location of the prefrontal cortex, shown in brown, is a major region of importance where ADHD treatment is of concern. The green, red and blue regions represent approximate locations of sub-components of a brain region collectively called the corpus striatum. Both the prefrontal cortex and the corpus striatum regions of the brain are thought to be common sites of imbalance of the brain chemicals dopamine and and norepinephrine. Getting back to our main point here, however, is the fact that supplementation with tyrosine typically reaches its targets with much more specificity than does L-DOPA. In other words, if target region specificity is what we're after, then supplementation with tyrosine shows a slightly better track record, at least according to the literature reviewed by this blogger. Keep in mind, however, that this assertion hinges on only a few older studies, and the findings are far from definite. Fewer negative side effects: This ties in with the previous point, to a certain extent. L-DOPA, is, and continues to be, a treatment for Parkinson's, and not designed specifically for ADHD. However, in addition to being a chemical precursor to dopamine and norepinephrine, L-DOPA can also be converted to the agent melanin (which is responsible for skin pigmentation, among other things). The problem with this, however, is the fact that this conversion process can sometimes go overboard, and result in rapid generation and buildup of this (and related) compounds, increasing the risk of melanoma and related skin cancers. The actual magnitude of this L-DOPA/skin cancer association, however, is often questionable. While higher rates of skin cancer are seen in Parkinson's patients treated with L-DOPA, this finding is often negated by the fact that the cancer was present before the start of the L-DOPA treatment. Furthermore, general medical recommendations are often to refrain from L-DOPA or tyrosine supplementation in Parkinson's patients who are in various stages of these cancers. In other words, tyrosine may not be much better in this regard. Both tyrosine and L-DOPA have limitations, and potentially negative interactions. This includes kidney and liver dysfunctions, cases of depression where specific anti-depressants called MAOI's (short for monoamine oxidase inhibitors) are taken (both tyrosine and L-DOPA can negatively interact with MAOI function). Possible buildup of the compound homocysteine (a pro-inflammatory agent which has been implicated in everything from heart disease and cardiovascular disorders to depressive symptoms to cancer) can also be linked to tyrosine and L-DOPA intake, because both can serve as chemical precursors to this potentially dangerous compound. We will see how homocysteine ties in to all of this within the next few posts (as we work our way down the tyrosine to dopamine and norepinephrine pathway), and how its buildup can be reduced by taking in adequate levels of certain B vitamins and other nutrients. More on this later. In the meantime, please realize that there are hundreds of different ways tyrosine and L-DOPA levels can affect the body, so trying to classify one as "safer" is not necessarily so cut-and-dry. However, in this blogger's opinion, tyrosine, since it is a naturally occurring dietary food-source, has the advantage of over L-DOPA in that it is one step closer to "nature". Tyrosine is typically less potent than L-DOPA, so a higher dosage of tyrosine is typically required to get the same effects (in other words, we shouldn't be comparing, say a 500 mg dose of tyrosine with a 500 mg dose of L-DOPA, the effects of L-DOPA at this dose would be much more pronounced). Furthermore, as we have seen in the last post on tyrosine and ADHD, the enzyme-mediated conversion of tyrosine to L-DOPA is actually limited or shut off by the generation of the catecholamine "end-products" dopamine and norepinephrine. When high levels of these compounds are generated under normal conditions, these catecholamine compounds actually bind to and inhibit the enzyme tyrosine hydroxylase (which converts tyrosine to L-DOPA), thereby limiting further tyrosine to dopamine conversion. In other words, it appears that tyrosine has slightly better designed "control-switches" to keep its end products in check than does L-DOPA. We may be splitting hairs here (since both tyrosine and L-DOPA are natural metabolites of the body, both can be quite safe if the correct levels are taken and none of the pre-existing conditions exist or competing medications are being used), but according to all of the information this blogger currently has, tyrosine supplementation for ADHD treatment seems to be the safer bet here. ADVANTAGE: Tyrosine (just make sure to consult with a physician before trying this supplement, even though it is readily available over-the-counter). Overall effectiveness and potency: While both L-Dopa and tyrosine have often been prescribed for ADHD as more natural or "gentler" alternatives to pharmaceuticals, and "success" stories abound on individual cases, the overall literature tends to be less praise-worthy. From the studies this blogger has seen most of them show a temporary boost in effectiveness, but the positive results are often short-lived. Tolerance generally seems to be an issue, as in the case of a small study on direct tyrosine treatment for ADHD. In this study, the effectiveness of tyrosine wore off after 2 weeks. A similar study was done with L-DOPA (levodopa) on ADHD boys, and the results were similar. Initially, there was a positive response, but these results were also short lived. Curiously, most of these studies involving direct tyrosine or L-Dopa dependent treatment of ADHD are relatively old ones, most of which took place in the early 1980's (many were done by the same research group). There currently does not seem to be a whole lot of new material on this topic (at least to the best of this blogger's current knowledge). Furthermore, neither of these studies co-supplemented with the aforementioned nutrient "cofactors" to help with the metabolism and conversion to dopamine or norepinephrine. There is no telling what the status of magnesium, zinc, iron, or antioxidant levels (all of which can have an effect on tyrosine metabolism, as we've seen in the previous post on tyrosine supplementation for ADHD). Additionally, another nutrient called pyridoxal phosphate also plays a role in the next step of the chemical conversion process of L-DOPA to dopamine (pyridoxal phosphate is a derivative of vitamin B6 which is used to help the enzyme dopa decarboxylase to function properly. We will be investigating this nutrient/enzyme pairing in the next post, when we look at the next step of the dopamine conversion process). Levels of this key ingredient (at least in this blogger's opinion) need to be factored in when we evaluate the true merits of tyrosine or L-DOPA treatment for ADHD and related disorders. ADVANTAGE as an ADHD treatment method: Too close to call. In addition to their individual usage, tyrosine/L-DOPA/carbidopa (we will discuss why this carbidopa compound is often used alongside L-DOPA in the next section) can be used together to boost each others' effectiveness. Anecdotal reports laud the effectiveness of tyrosine/L-DOPA/carbidopa in combination as an effective ADHD treatment, but again, detailed clinical trials specifically designating ADHD are relatively scarce. In other words, although the literature findings on the subject seem to be scarce and somewhat discouraging, additional factors (such as the extra nutrients and enzyme co-factors which we are currently laying out) could possibly lead to more effective studies with more promising results on the topic of ADHD treatment via tyrosine and/or L-DOPA supplementation. Fascinating research, confirming my hypothesis that enzymatic functions are a major factor in ADHD. That said, the combination of tyrosine and P5P, personally, produces psychosis within 30 minutes. Phenylalanine, oddly, does not. Thanks for this article, very effective information. can i use vitamin b3? initially i bought tyrosine and b3 for my son for adhd, now in this blog it's b6 what is the difference? Very articulate, well written, and professionally done. A big thank you! This study contradicts the statement at the beginning of this blog post that states that lower levels of dopamine are typical. In this study they found that there was not a lack of dopamine in adhd patients when compared with healthy patients. great blog by the way! Thanks for doin all the work! Are you out there 6 years later? , can I discuss with you what you have resurched and tried and what you have personally found? I came across through your blog. Thanks for sharing the valuable content. This was extremely helpful and well written! It was easy to understand for someone who avoided chemistry at all costs during her education. Having been recently diagnosed with ADHD it really helps to be able to make informed decisions about medicinal interventions.